Tamra K. Waltemath was born and raised in Nebraska before moving to Colorado to attend college. She obtained her under-graduate degree from the University of Colorado and her Juris Doctorate from the University of Denver. She obtained her law degree in 1989 and has been practicing law since that time. She was the in-house counsel for a small oil and gas company before opening her own practice in 1994. 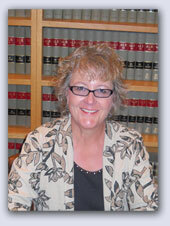 Her practice has always focused on estate planning, probate and estate administration, real estate and family law. She primarily practices in Denver, Jefferson, Broomfield and Adams counties. She has been a member of the Colorado Bar Association’s Elder Law Committee since 1995 where she served for a short time as treasurer. She volunteers her time to help the needy through Denver Probate Court, the Spirit of Christ Church, and Metro Volunteer Lawyers. Tamra’s goal is to help her clients plan for the future while taking into account the laws of wills, taxes, insurance, property and trusts. Tamra believes that her clients are entitled to respect and to have their legal matters handled in an efficient, timely and affordable manner. Her office prides itself on customer service. Tamra and her staff communicate regularly with their clients and promptly return phone calls and emails. Tamra practiced in the Brundage building on 7390 Lowell Blvd. From 1995 until 2005 when she moved into offices at 3843 West 73rd Avenue. She is committed to helping people in the south Westminster/north Denver area. Her office hours are 9-5 Monday through Fridays. Her office has handicapped access at the rear entrance of the building. Limited home and offsite appointments are also available upon request. Tamra was married 28 years before losing her husband to cancer. She has one daughter. Her hobbies include gardening, skiing, reading, cooking, horseback riding and hiking in the mountains. She has authored a chapter on Estate Planning for "The HIV Affected Family" and was the legal editor for the book "Passing on Love" published by The Adoption Exchange. Several articles Tamra has written may be read here. "Tamra was very pleasant and helpful in preparing my will. Office help is professional and very courteous. I will recommend her to all friends and family. She led me down the right path to my wishes after death." "I highly recommend Tamra and her staff to prepare your wills, powers of attorney etc. She has worked with several of my family members and a friend who recently passed. Thanks to Tamra and staff. Everything has gone smoothly. Without her we would have had a lot of problems including probate!" Tamra and Becky made the process of obtaining my will effortless and painless. Tamra was very thorough and explained everything to me as well as making recommendations for my personal situation. I passed around her business card to friends and encouraged them to call and make an appointment." Excellent service. Tamra made everything easy to understand. I feel more secure now that we have our choices in place. Tamra and Becky made the process of obtaining my will effortless and painless. Tamra was very thorough and explained everything to me as well as making recommendations for my personal situation. I passed around her business card to friends and encouraged them to call and make an appointment. It was a pleasure working with Tamra to finally get our will, trust and powers of attorney done. She helped to turn the legal jargon into terms we were comfortable with and could understand. I would refer her to anyone needing to do estate planning. Tamra was very pleasant and helpful in preparing my will. Office help is professional and very courteous. I will recommend her to all friends and family. She led me down the right path to my wishes after death. I am greatly impressed with Tamra. She is very knowledgeable about my needs. She explained all papers to me. I feel very comfortable with her. Very informative and caring sweet spirits. Thanks for your kindness in making this task bearable. Very detailed and concise. The initial consultation conducted was valuable in relaying to Tamra exactly what your needs and desires are. The final wills were flawless. The will I received will require no alterations in the future because it covered all the scenarios. We recently relocated to Broomfield Count and had previously written our own wills and medical powers of attorney. Now retired we wanted legal help to create a family trust and avoid any probate procedures. We got a recommendation from various sources and interviewed Tamra. We immediately determined she had the experience and patience we were looking for. She and her staff provided timely advice and documents to allow us to continually make progress and finalize a well prepared family trust supported by new wills and powers of attorney consistent with Colorado law. She was easy to communicate with on an ongoing basis and we had three detailed meetings that really helped us understand and get advice. We would recommend Tamra for any Elder or Estate Law needs. She has helped us with the guardianship which we needed after our so was injured severely in an auto accident. She walked through the entire process with us, making it as easy as possible. She told us each step and did additional research for us on a side topic. We were well pleased with her services.